Are you in fear of your home or business being broken into, burgled and ransacked? Of your property being stolen, and trespass into your private and personal world? You must safeguard at all times to protect your family and your property. Glass has typically been the weakest link in your home or business. 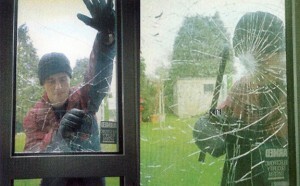 It takes only one blow with a hammer to gain entry through your windows and doors. One hit to your front, rear or patio door and the criminal walks in unobstructed. You no longer have to live like a prisoner in your own home with unsightly steel bars covering your windows. Now you can have BREAKTHROUGH® Resistant Glass working for you twenty-four hours a day, protecting against criminals breaking into your home. We manufacture BREAKTHROUGH® Impact-Resistant Glass of two sheets of glass bonded by a clear, strong, flexible polymer that holds the glass together upon impact. It resists repeated heavy (and noisy) blows before breaking, a fact that discourages intruders. It provides 24-hour peace of mind, helps prevent injuries caused by shattering, protects your furnishings from exposure to sunlight and fading, and controls sound transmission. Available in any combination of double or single glazed in clear or patterned glass and in any color. BREAKTHROUGH® Resistant Glass is a registered trademark of Glasslam N.G.I. Inc, Dependable Glass Works, Inc. is a licensed Manufacturer/Distributor of this product. For more information, contact us at sales@dependableglass.com.